The birefringent filter plate is a linear retarder made of a-cut (or 90o cut with the optical axis in the plate face) crystalline quartz and used intracavity to selectively tune a desired wavelength and create reflection losses at other wavelengths. In use, it is placed at Brewster’s angle, and then rotated about the axis perpendicular to the surface to achieve a full wave retardation at the wavelength of interest. The selected wavelength contains only a p-polarization component, and thus experience no reflection loss. Other wavelengths undergo a different retardation, and have some amount of s-polarization, leading to reflection losses. 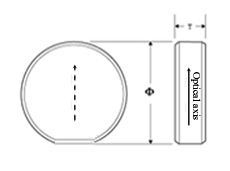 A birefringent filter used in a short-pulse laser cavity can be a single quartz plate. 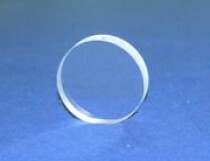 A birefringent filter for a narrow linewidth CW laser can contain a stack of 2–4 quartz plates, each plate being half the thickness of the previous one. The thickest plate sets the bandwidth and the thinnest the free spectral range (FSR). The birefringent filter plates in this page have a thickness of multiples of T (T=0.5mm) with the diameter of 1" or 0.5". More quartz plates/blocks with various apertures, thicknesses and coatings are available under the general "Quartz Crystals".